Wilczek Peak was named by the German zoologist and mountaineer Robert Von Lendenfeld in 1884. From Whymper Hut follow the Callery Saddle route to the snow basin east of the pass. Climb snow slopes to a col south of Pt 2093 metres. 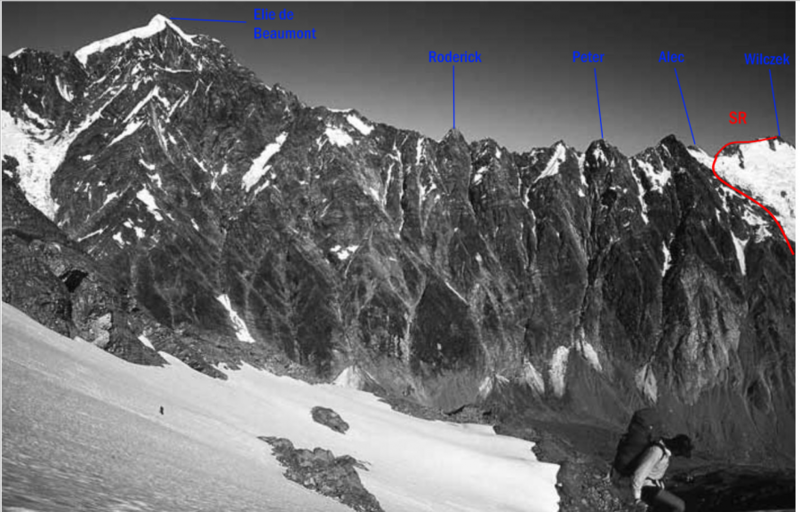 Cross the Callery Glacier then ascend snow slopes and a short gully onto the North West Ridge. A quick rock scramble leads to the summit. From Whymper Hut, follow the gully draining between Mt Wilczek and Mt Alec, then snowfields beyond Pt 1573 metres up towards the Maximilian Range. The pleasant rock scramble along the South Ridge is a little longer and more challenging than that along the North West Ridge, and leads over a subsidiary peak en route.